Sometimes the longer a pup is at a shelter, the less likely it feels he'll ever get adopted. One shelter decided to give an extra boost to a dog who has been particularly down on his luck. The Humane Society of South Mississippi was troubled that a wonderful dog named Elmo hadn't found the right family for him. Elmo came to them, sickly and weak, from an overcrowded local shelter where he was on the euthanasia list. "He is such a great dog ... he's a great size, he's got a great personality and he's breaking our hearts every day he stays in the shelter," the Humane Society of South Mississippi told The Dodo. "So, we decided to post just exactly how many days he has been here." 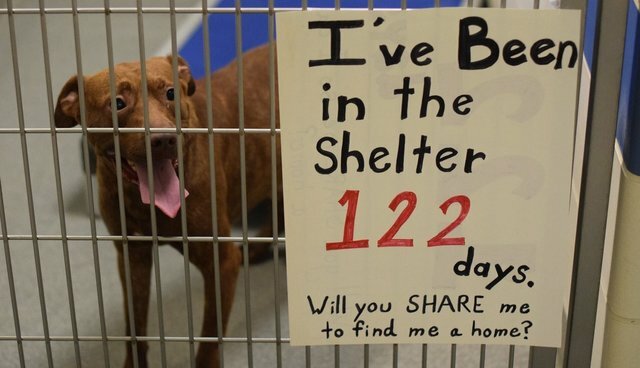 The shelter took to Facebook and posted a picture of Elmo standing next to a sign saying just how long he'd been in the shelter. So far, the post has been shared over 1,100 times and has been seen by nearly 26,000 people. "We're crossing our fingers and paws that today is his day," the shelter said. Elmo is positive for heartworms, but through a local program called "Roxy's Fund," the entire cost of his treatment will be paid for - he just needs a home he can be treated in. Elmo's named used to be Lucky, but the shelter changed it because they had a feeling he wasn't feeling so lucky. With a new name and a new social media campaign, the shelter is hoping someone will see Elmo and decide to welcome this amazing dog into their home. UPDATE 8/7 -- Elmo has been adopted! His name is now Bentley, and he couldn't be more thrilled to finally be going home!